Feudal Alloy, an upcoming Metroidvania action RPG, centers around a bizarre concept. You play through a medieval era as a robot powered by a goldfish, who is on a quest to defeat bandits that burned down their home. You're not the only goldfish piloting the robot. In this strange world, all enemies you go head-to-head with are similarly powered by fish. 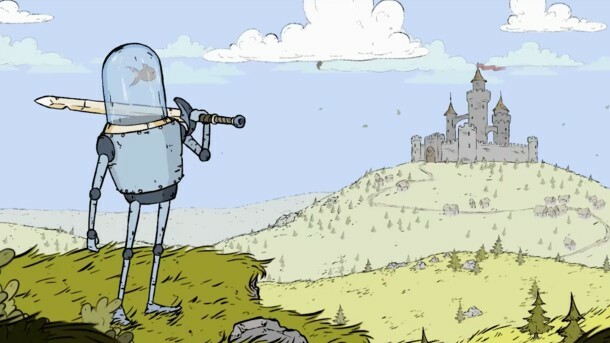 Feudal Alloy features hand-drawn 2D art, giving it a storybook vibe. Developer Attu Games describes the gameplay as discovering a "huge interconnected world, filled with wide range of enemies, bosses, skills, equipments and side quests." Feudal Alloy is expected to launch on PC later this year, though no specific release has been announced.